The Czech musical diaspora in the eighteenth-century was headed by the great Bohemian families that headed westwards in search of lucrative employment in the German courts. One of the most illustrious, indeed the most famed, was the Benda family. It was Jiří Antonín, Germaned to Georg, who was to spearhead an incursion to Gotha and thence to Berlin. 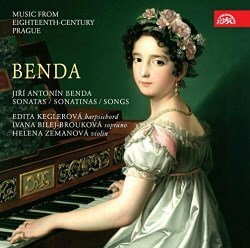 This disc, part of Supraphon’s enlightened and enlightening series devoted to ‘Music from Eighteenth-Century Prague’ celebrates Benda as composer of sonata and song. Listening to the sonatas in particular, it would be fair to say that his music was hugely informed by the influence of C.P.E. Bach. How else to explain those teasingly abrupt, asymmetrical fault lines in his development sections, or the sometimes cussed way he subverts preconceptions. Yet once these influences are acknowledged, one can also revel in his harmonically probing writing – the F major presented first in the programme is a classic Benda example - as well as the boldness of his musical conception. Though there is a suitable element of expression in the central slow movement, classic asymmetry returns in a finale that manages to keep the listener on his toes throughout. Whilst the C minor is slightly more conventional, the other F major sonata (tracks 23-25) gives us more of those small phrases that are constantly being broken up, reassembled, and then discursively set off in different directions. The Sonatinas are clearly devised on an altogether smaller platform yet they manage to punch above their weight, bringing plenty of drama amidst some of the more genteel, gestural writing. The Violin Sonata in G major is not quite so striking in these respects, somewhat hearkening back stylistically. It is, though, finely structured and well played. The songs are all set to German texts. They’re brief, in the main, and not as harmonically or stylistically adventurous as the sonatas. Some have a cello continuo in addition to the harpsichord. That said, there is some ardent music to be heard – not least Mir Armen, den des Fiebers Kraft as indeed there is much melodic elegance: try Ich liebte nur Ismenen. The star of this show is harpsichordist Edita Keglerová, who plays throughout and with a sure awareness of Benda’s occasionally capricious twists and turns. The accompanying instrumentalists are fine; Helena Zemanová does well by the Violin Sonata. Soprano Ivana Bilej Brouková is technically good but has a rather thin and somewhat inexpressive voice. The notes cover the ground well and the German song texts are here, translated into English, French, and Czech. I am in two minds about the recording. It’s attractive in the main but I wonder if it’s set too close to the harpsichord, thereby catching a bit of ‘air’. In any case it’s nothing too serious, and doesn’t really detract from the main reason for acquiring this disc, which is the three keyboard sonatas.